Banihal: One-way traffic on the Jammu-Srinagar national highway resumed Sunday after authorities cleared the road of debris following a landslide, officials said. A massive landslide struck the highway — the only all-weather road linking Kashmir with the rest of the country — near Ramsoo in Ramban district Saturday evening and it took at least five hours for the agency concerned to clear the 270-km highway for traffic movement, the officials said. They said stranded vehicles were allowed to ply Saturday night itself and Srinagar-bound vehicles were allowed from Jammu Sunday morning. The traffic on the highway was going on smoothly, the officials said. Authorities restricted the traffic to one-way on the highway, alternately from Srinagar and Jammu, early this month to avoid frequent traffic snarls. 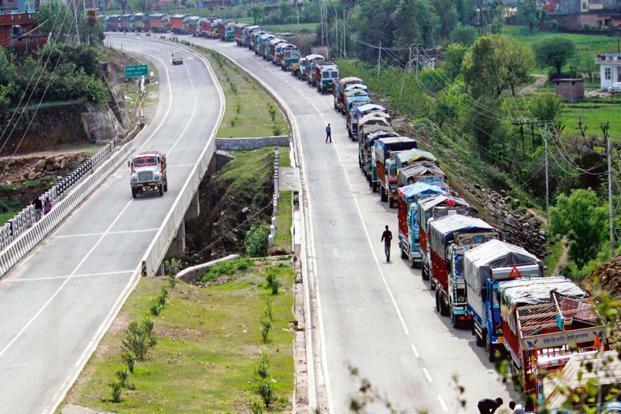 The heavy movement of trucks carrying fresh fruit from Kashmir to outside markets, bi-annual move of nomadic communities especially Gujjars and Bakerwals, and the ongoing expansion work on the highway have forced the authorities to restrict traffic movement on the crucial road.